Is There an East-West Split in North American Natural Gas Markets? 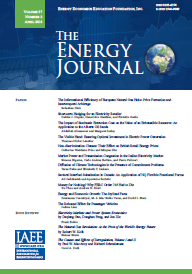 This paper presents evidence concerning shared stochastic trends in North American natural gas (spot) markets, using monthly data for the period that natural gas has been traded on organized exchanges (from June, 1990 to January, 1996). In doing so, it uses the Engle and Granger (1987) approach for estimating bivariate cointegrating relationships as well as Johansen's (1988) maximum likelihood approach for estimating cointegrating relationships in multivariate vector autoregressive models. The results indicate that the east-west split does not exist. The main thesis of this paper is that passive transmission rights such as Transmission Congestion Contracts (TCCs) that are compensated ex-post based on nodal prices resulting from optimal dispatch by an Independent System Operator (ISO) will be preempted by the strategic bidding of the generators. Thus, even when generation is competitive, rational expectations of congestion will induce implicit collusion enabling generators to raise their bids above marginal costs and capture the congestion rents, leaving the TCCs uncompensated. These conclusions are based on a Cournot model of competition across congested transmission links where an ISO dispatches generators optimally based on bid prices. We characterize the Cournot equilibrium in congested electricity networks with two and three nodes. We show that absent active transmission rights trading, the resulting equilibrium may be at an inefficient dispatch and congestion rents will be captured by the generators. We also demonstrate how active trading of transmission rights in parallel with 42 competitive energy market can prevent the price distortion and inefficient dispatch associated with passive transmission rights. In Chao and Peck (1996), we introduced a new approach to the design of an efficient electricity market that incorporates externalities due to loop flows. This approach enables an innovative flow-based bidding scheme for pricing transmission services. In the short term, due to some technological constraints, a hybrid institutional structure that encompasses a decentralized contract market (via the system operator) is necessary for implementation. In this paper, we present an incentive scheme that fosters efficiency and reliability within such art institutional structure. An essential ingredient is that the system operator provides all electricity traders choices of priority insurance against interruptions. We show how this scheme will ensure the integrity of the electrical contract market and provide the system operator incentives to maintain system reliability in all efficient manner in real-time dispatch. Traders in a power exchange can use insurance to hedge against losses from curtailment by the system operator. If the system operator is liable for these reimbursements then its incentives encourage efficient real-time dispatch. This paper reviews the details of implementing such a scheme when third-party insurers offer insurance in an auxiliary competitive market, or the power exchange operates as a mutual insurance association of the traders. Because higher reimbursements entail higher service priorities, the actuarial premium for pure insurance must be accompanied by a surcharge for service priority. The amount of this surcharge can be inferred from the price of pure insurance. The Appendix shows that omission of this surcharge distorts traders' incentives in the power exchange.